Lenz & Staehelin was formed in 1991 when Conrad Staehelin’s Zurich firm merged with Raoul Lenz’s Geneva practice. Both arms of the firms already had experience of arbitration going back decades before the merger. The team on the Geneva side included the late Robert Briner, who served as a judge at the Iran-US Claims Tribunal in the 1980s and went on to be chairman of the ICC International Court of Arbitration and a renowned arbitrator. These days the group is headed by partners Xavier Favre-Bulle in Geneva and Harold Frey in Zurich, who both sit as arbitrators. The team is split evenly between the two cities (there’s also an office in Lausanne), with more than 40 fee-earners available for arbitration matters. The firm acts in cases involving states and state-owned entities in international disputes It also has private clients from industries including pharmaceuticals, energy, telecoms, construction, financial services and luxury goods. The list includes some well-known Swiss blue-chip companies and multinationals. Unfortunately, few of the firm’s clients are on the public record but it is known to have advised France, and Romanian state entity Hidroelectrica. Going further back, it advised Deutsche Telekom (in a dispute with Vivendi). Supermarket chain Carrefour, multinational engineering and electronics company Bosch and tobacco group Philip Morris have all used the firm previously. It also regularly co-counsels with international firms on large matters with a Swiss angle. One spectacular result for the firm came in 2016 when it helped a government in the Middle East to defeat a claim for more than US$1.5 billion in damages, as well as a claim for the issuance of a long-term concession. The client also received a large part of its costs. It has helped four of the most important industrial groups in Germany defeat a billion-dollar claim by a US company; and successfully defended the manufacturer of a desalination plant in a subcontractor dispute, winning costs. For a healthcare company, it helped to settle a multibillion-euro dispute over the termination of licence and supply agreements – agreeing terms that allowed the client to maintain the business relationship. Another highlight saw the firm represent an Irish company in a successful Geneva arbitration against a Libyan state entity over the use of a fibre optic cable across the Mediterranean. Lenz & Staehelin helped Romania’s Hidroelectrica defeat a €43 million ad hoc claim by a Swiss energy trader that alleged it failed to comply with an energy supply contract in the face of insolvency proceedings. The firm co-counselled with Romanian firm Leaua Damcali Deaconu Paunescu on the case. A team led by partner Harold Frey and counsel Martin Aebi in Zurich also secured a win for Germany’s Thyssenkrupp Industrial Solutions in an ICC dispute with an Istanbul-based fertiliser manufacturer over outstanding payments for the construction of a plant in Turkey. The construction group was awarded €24.5 million and 90% of its costs by an all-Swiss tribunal. Alongside Norweigan firm Wikborg Rein, Frey represented a Danish energy company in a gas price review arbitration. The firm’s client was awarded a revision, as well as a reimbursement of the excess payments made under the gas price contracts during the relevant revision period. Lenz & Staehelin also helped a private equity fund to settle a US$200 million dispute with a major pharmaceutical corporation on favourable terms. Xavier Favre-Bulle is one of the newly appointed vice chairs of the IBA arbitration committee. Meanwhile, as arbitrator he chaired a panel that rendered an ICC award in favour of a Turkish construction company in a claim against Gabon. Zurich-based practitioner Fadri Lenggenhager was promoted to counsel. In Geneva, counsel Eugène Ibig sadly passed away. With over 200 lawyers and offices in three major economic centres, Lenz & Staehelin is the largest law firm in Switzerland. Known for its high professional standards, the firm provides its domestic and international clients with a full range of services in the main areas of law. It is ranked amongst the leading practitioners in business law. 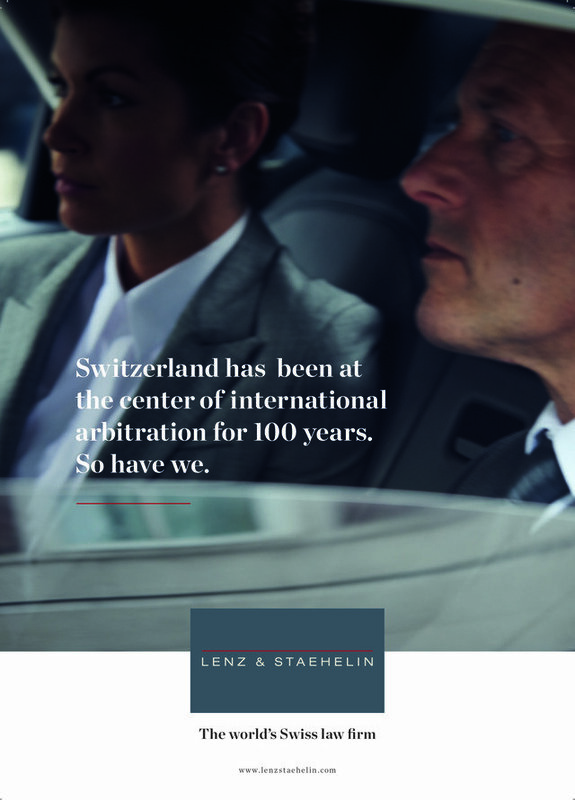 Historically, Switzerland has been a preferred center for international arbitration and Lenz & Staehelin has its solid part in that history. Over time, legal disputes and proceedings have become increasingly complex and require the highest level of expertise and sensitive handling. Our experience enables us to provide our clients with the support they need. Lenz & Staehelin has enjoyed a leading position in international arbitration for a number of decades. Our attorneys have been involved in several hundred international arbitrations, either as counsel for a party or sitting as arbitrators. Our arbitral practice is involved in institutional arbitration (in particular under the rules of the International Chamber of Commerce, the Swiss Chambers’ Arbitration Institution, the London Court of International Arbitration, the Court of Arbitration for Sport ), investment arbitration (International Centre for the Settlement of Investment Disputes), as well as UNCITRAL and ad hoc arbitrations. The firm’s International Arbitration group includes more than 30 attorneys (in Geneva, Zurich and Lausanne). Most have qualifications from or practical experience in foreign (in particular common law) jurisdictions.